Taking a break from studying for my Finance Exams tomorrow, I grabbed Ambeth Ocampo's Death by Garrote, Looking Back 3 and started reading some articles. What struck me most is the love story between one of our national heroes, Andres Bonifacio, and his wife Gregoria de Jesus. "I am Gregoria de Jesus from Caloocan, a dalagang Tagalog, minor. 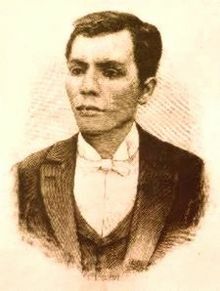 I wish to contract marriage with my fiance Andres Bonifacio of 11-E Sagunto Street, Tondo. When my parents found out of our good intentions, I was brought here, to Binondo, and placed in 28-D Madrid Street. I am truly a prisoner here. I have no liberty at all. I appeal to your power to mediate and give me justice. Take me from here, summon my fiance, fulfill the necessary government requirements so that we can get married. I ask justice from you and hope that you listen because this appeal is addressed to anyone with a kind heart." Of course, the letter is already translated from the original Tagalog. Andres and Gregoria became married eventually although the exact details on how (if her parents consented) this happened are not clear. Also, there were some confusion arising from Gregoria's autobiography where she mentioned that she married Andres in March 1883. However, in January 1884, Gregoria wrote another letter to the Gobernadorcillo again asking to be summoned so she could marry Andres. I think that simple trivia and information like this should be included in teaching History inside the classroom to "humanize" our heroes and make learning about them more interesting.